Good boat and dhoni, everything working. Great boat and dive crew, food good. Cons: 26 divers from one dhoni, too many divers in the water at one time but despite that it was very well organised. Maldives Master is a beautiful steel vessel measures 37m in length and 8m in breadth. With two engines onboard, it cruises at 13 knots per hour, onboard there is 220 volt power outlets with EU and UK sockets, plus USB charging. 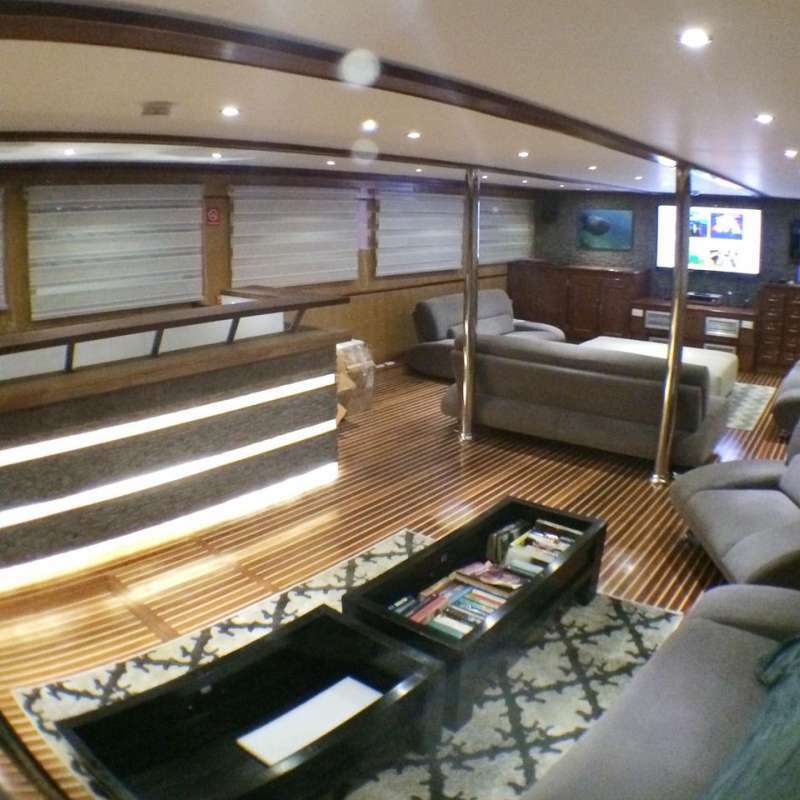 This vessel was originally built in 2001 and operating in the Red Sea before being completely refitted and moving to the Maldives during 2015 and 2016, now it operates as part of the Master Liveaboards fleet in Maldives. Maldives Master is specifically laid-out so guests can spend their holidays aboard in complete relaxation and benefiting from a separate tender and a the largest diving dhoni in the area, there is more than ample space on the Maldives Master for guests to sit back and enjoy their diving cruise. 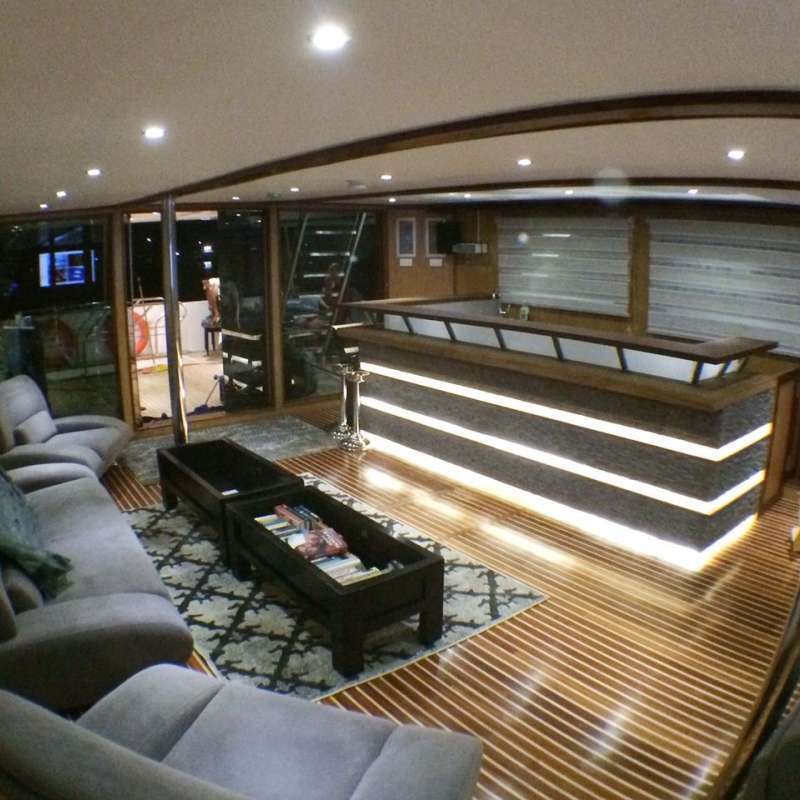 There is a generous outdoor dining area, bar and sky lounge, and even a Jacuzzi make for a luxurious stay on board. 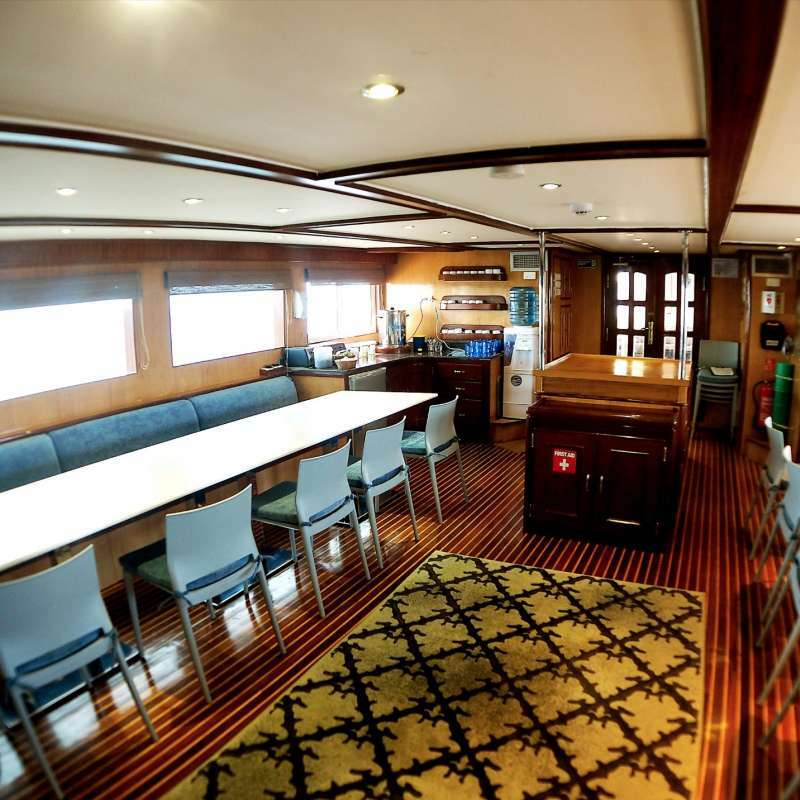 There are many options to put your feet up after diving: take your pick from three sundecks with comfortable seating and loungers or remain in the shaded lounge on the mid deck. 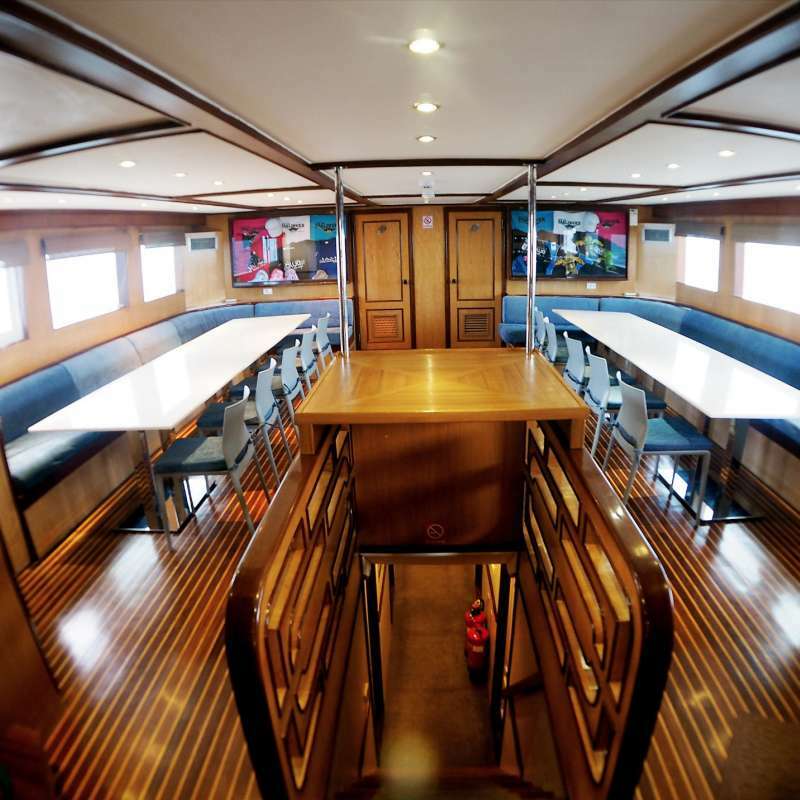 Maldives Master provide diving from the dive dhoni boat, which provide comfort and function at the same time. All the equipment stay in the dive dhoni (compressors, tanks etc.) in order to keep the noise away from the main boat when filling the tanks. 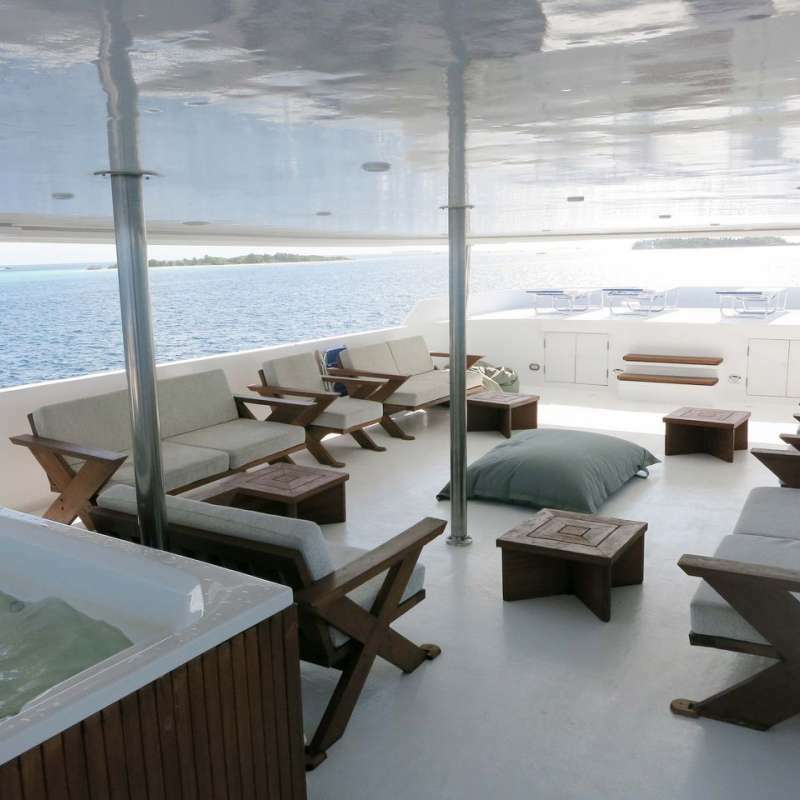 Maldives Master has 13 well-designed guest cabins, it can accommodate up to 26 guests per tirp. 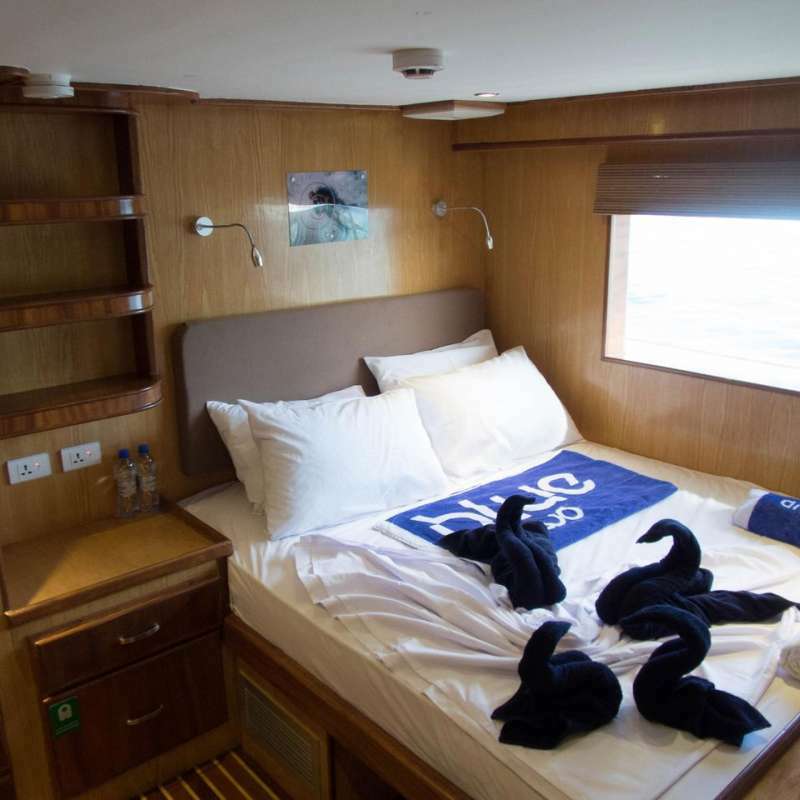 All cabins equipped with air-conditioning, ensuite bathroom, in-cabin entertainment system, a mini fridge, storage spaces and charging station with 220v EU/UK sockets. 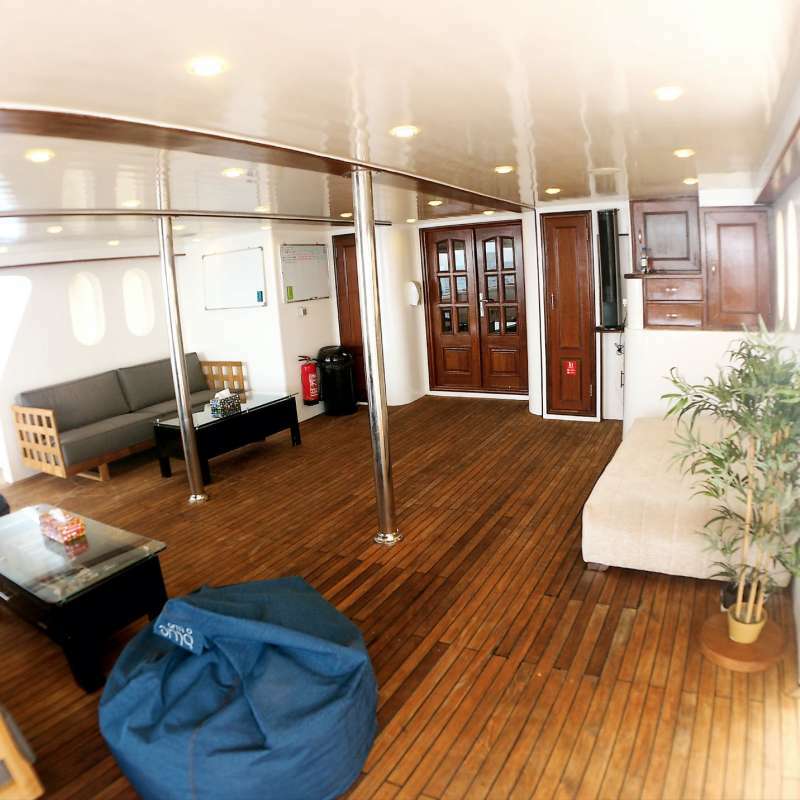 Located on the main deck, each cabin comes with one large double bed, seaview windows. 7 nights itinerary provides for between 18 - 20 dives. 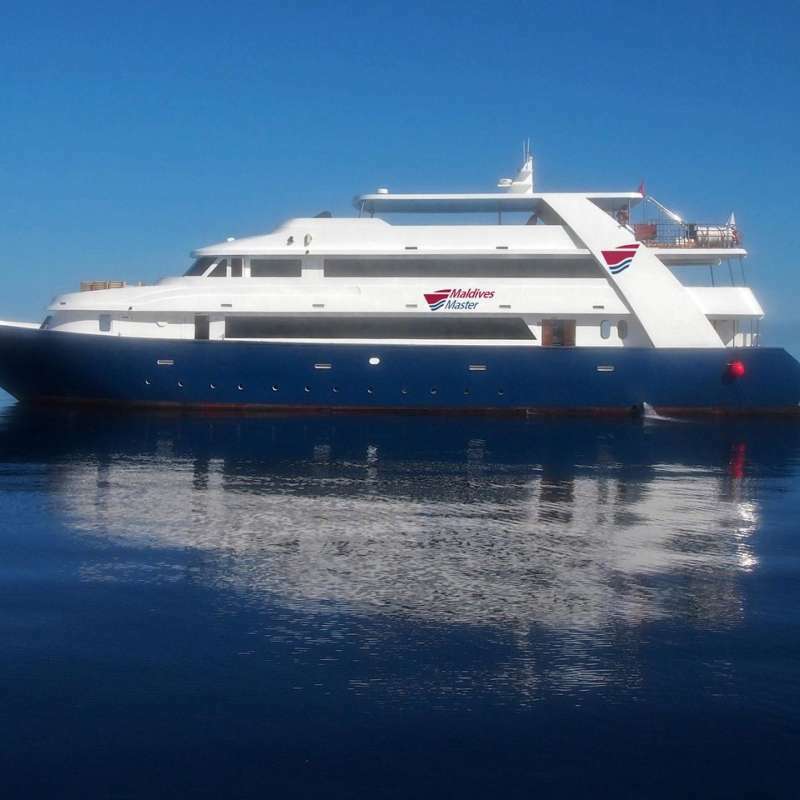 10 nights itineraries provides up to 30 dives per week. Wi-Fi Internet ：Available with additional cost. This itinerary takes you to a selection of the best dive sites in the Maldives. Departure and arrival in the port of Male, you will dive around the atolls of North Ari, Meenu, Vaavu, and South Male. As the name of the itinerary indicates; it takes you to a selection of the best dive sites in the Maldives. Departure and arrival in the port of Male. You will dive around the atolls of North Male, Rashdoo, Ari, Meemu, Vaavu and South Male. Explore the pristine reefs, beautiful caves and overhangs, and experience thrilling shark dives. This itinerary takes you to the highlights of the Central Atolls of the Maldives. Departure from and arrival at Male port. You will visit the following atolls: North and South Male, Felidhu, Rasdhoo, and Ari. This itinerary takes you to the best dive sites in the central part of the Maldives. You will get to visit the best dive sites around some of the following atolls: North and South Male, Felidhu, Meemu, Ari, Rasdhoo, North and South Nilandhoo, Baa and Lhaviyani. This itinerary takes you to the highlights of the Central Atolls of the Maldives. Departure from and arrival at Male port. You will visit the following atolls: North Male, Ari, Rasdhoo, and South Male, with the chance of manta ray, whale shark and shark sightings all year round. This Majestic Mantas Maldives dive trip is an ideal opportunity to dive with mantas, eagle rays, and more! You will visit the atolls of North Male, Raa and Baa. Departure from and arrival at Male port. The Cruise Director and Captain plan the itinerary based on weather, currents and other local circumstances. Please note that this itinerary will most likely involve some diving in currents. This exciting itinerary takes you to the less travelled southern part of the Maldives: to Vaavu, in search of the larger pelagic fish. We will visit dive sites such as Fish Head, Miyaru Faru, Fotteyo Kandu (Vaavu Atoll), Kandooma Thila at South Male Atoll and Guraidhoo Kandu South etc. More channel diving is offered to maximise your chances of 'big fish' encounters and manta cleaning stations are also visited. There are chances of seeing whale sharks too. This itinerary takes you to the best dive sites in the southern part of the Maldives around Huvadhoo atoll. Departure and arrival: Gaafdhal. Domestic flight from Male to Kaadedhdhoo Airport is needed. Generally, the Maldives atolls situated further south do not experience as much heavy traffic as the northern atolls. This has allowed the marine life to flourish, together with the seasonal monsoons that bring an influx of nutrients to feed a great variety of corals and fish on these remote Maldives dive sites. Possible sightings include black tip sharks, white tip sharks, nurse sharks, sunfish (Mola mola), huge ocean manta ray, spotted eagle rays, whiptail stingrays, hawksbill turtles, and whale shark sightings. As the name of the itinerary indicates; it takes you to a selection of the best dive sites in the Maldives. Departure and arrival in the port of Male. You will dive around the atolls of North Male, Raa, Baa, Rashdoo, Ari, and South Male. The nutrient-rich waters in these areas make a perfect environment for manta rays to feed and there is also the possibility of shark and whale shark sightings on this fantastic underwater adventure. As the name of the itinerary indicates; it takes you to a selection of the best dive sites in the Maldives. Departure and arrival in the port of Male. You will dive around the atolls of North Male, Baa, Raa, Noonu, and Lhaviyani. Enter a wonderful world of kandus, thilas and wrecks. There really is so much to explore in this 10-night diving adventure, with expected sightings of sharks, eagle rays, tuna, manta rays and whale sharks. You will get to visit the best dive sites around the atolls of Huvadhoo, Laamu, Thaa, Meemu, Vaavu and South Male. Ports: Male to Gaafdhal or Gaafdhal to Male. Either upon arrival or departure, in order to get to/from Gaafdhal, we can organise for you a domestic flight to or from Kaadedhdhoo Airport to Male Airport.